When we moved into The Mad House, I was thrilled that I would be able to have a dedicated craft work room. Since it wasn’t in the budget to have custom built-ins or Martha Stewart craft storage, I made do with what we had. In the almost 2 years that we have owned the house, I have added a few more work room storage solutions to the space that I’d like to share with you. 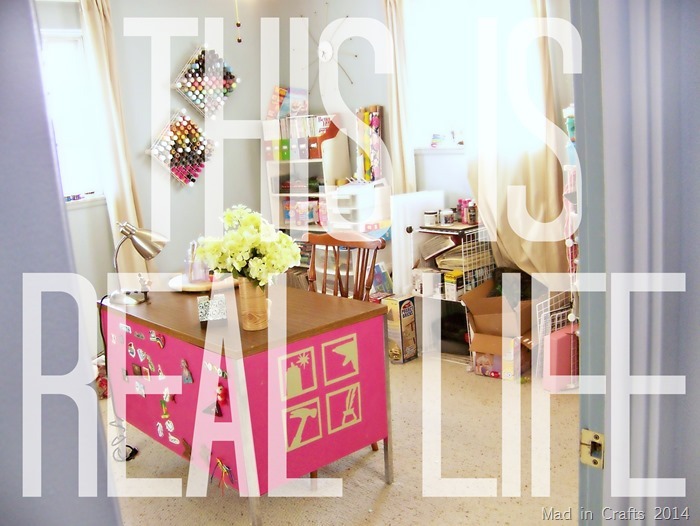 This entire week Angie from The Country Chic Cottage will be featuring the work spaces of creative bloggers. You will be able to get a glimpse of where the projects you see on Pinterest actually start! If you’ve just stopped over from Tried & True for the first time, welcome! I hope you will stay to poke around a bit when you are finished reading this post. I like to be able to see as many of my craft supplies as possible when I am creating in my work room. It helps me to be able to see at glance what materials I have to use, and, as an added bonus, it adds color to the room. 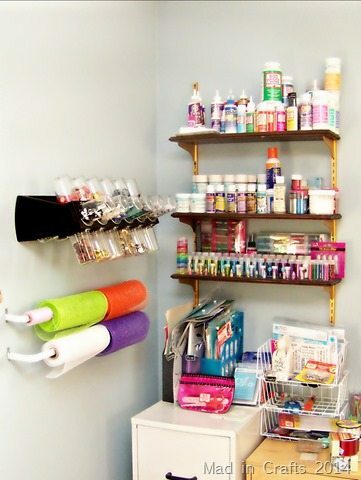 If you stepped into my craft room, you would see tons of open shelving, clear plastic containers, and craft supplies hanging from the walls. 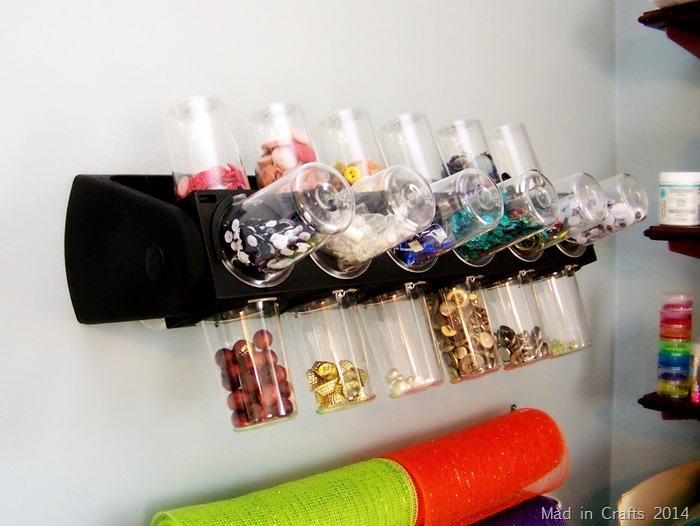 I added these simple hanging storage solutions in the past year. The decorator mesh and baker’s twine are just slipped over sturdy curtain rods which are screwed into the wall. I can pull off as much as I need for any given project, without having to haul the rolls in and out of storage. This bad boy is one of my favorite storage units in the room. I found it at Menard’s when they were having a $10 rebate on the item, so it was a steal. It stores my tiny craft supplies in clear cups, which easily pop off and back on again as needed. The cool part of the unit is that it rotates, so it stores tons of items in a small amount of space but all the materials are easily accessible. Nice, right? 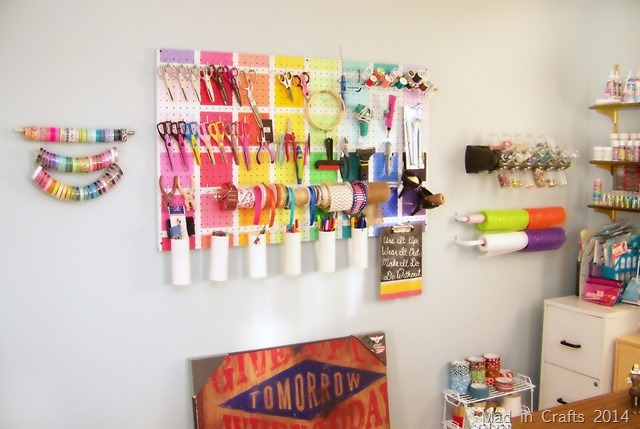 Those hanging storage racks are placed to the right of my big Project-Runway Inspired Peg Board. That was a curbside find, and it adds so much stylish storage to the room. To the left of the pegboard is my Macgyver-ed tape and ribbon storage. The washi tape hangs from a wood dowel suspended between two L hooks. The glitter tape and grosgrain ribbon are threaded onto twine that is knotted onto more L brackets. Again, I can easily see all the colors and patterns I have available, and I can cut off just as much as I need for my current project. 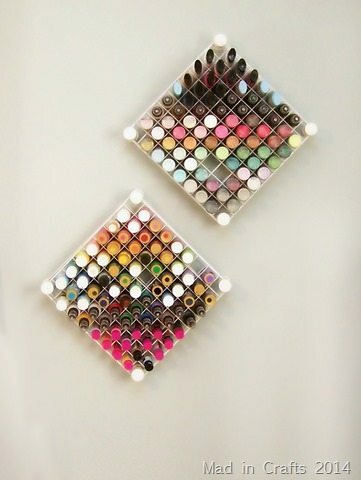 Have you noticed that almost all of my craft supplies are ordered by the colors of the rainbow? That is the one way I keep the room from looking totally chaotic. Plus, it’s pretty. I have put my Hanging Paint Storage Racks to the test, and they are holding up like champs. Even filled to busting, the paints and the racks are secure. 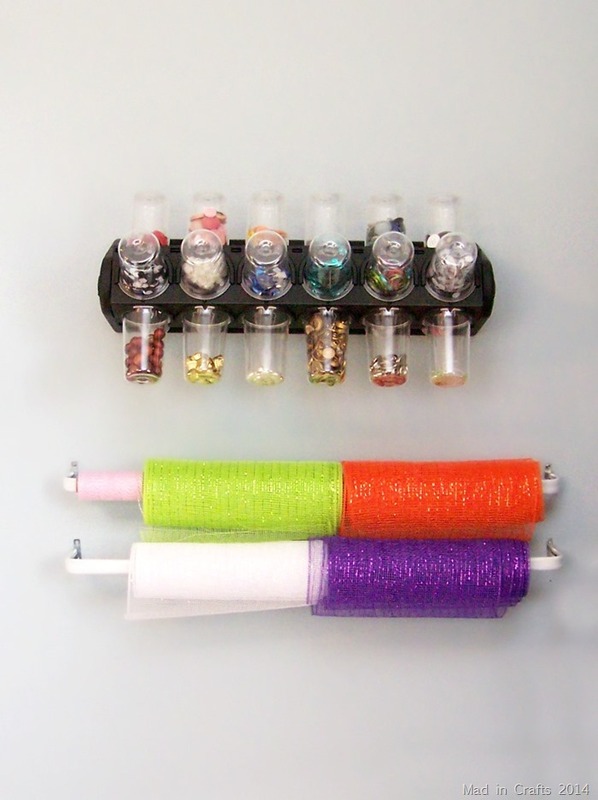 I use wire shelving in my work room because it is a cheap alternative to other storage systems, and it’s customizable. I can configure the wire cubbies however I choose, and I can stack the wire shelves and baskets to save on space. A small cubby unit meant for shoes fits my cans of Old Village paint and stains perfectly. 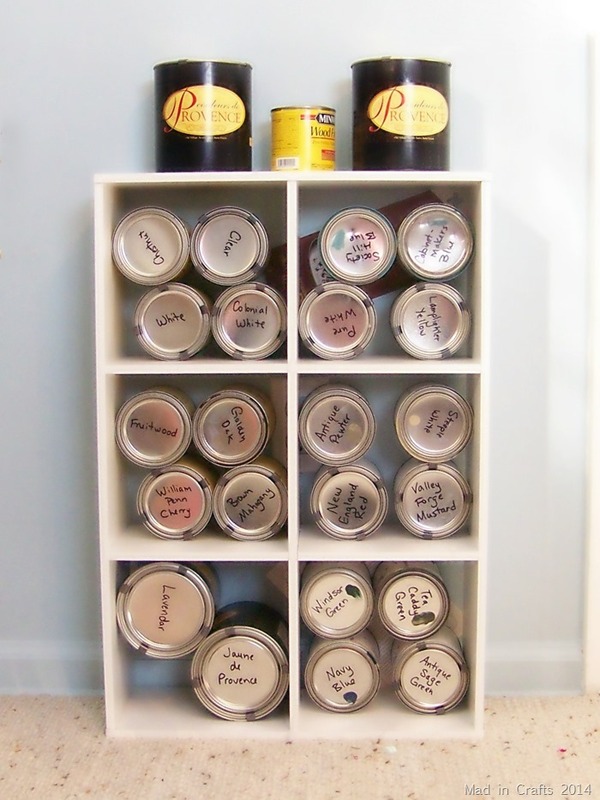 I just wrote the color names on the top of each can so I can easily find what I need. I found some of the storage units in my work room in thrift stores, so keep your eyes peeled for good deals. 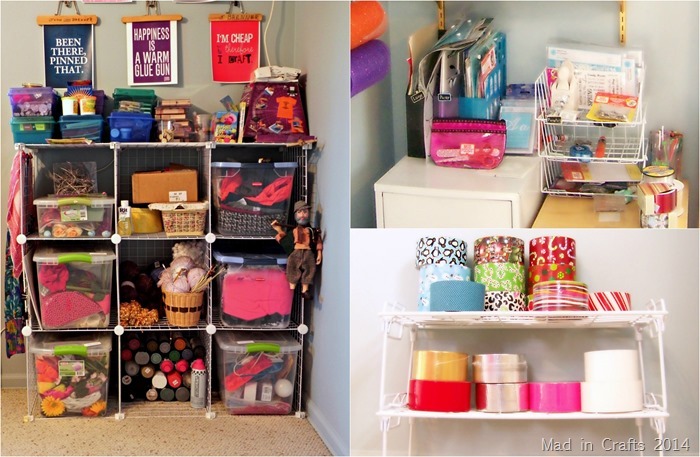 My craft room isn’t magazine-ready, but it is a perfectly functional space that suits my needs. I hope you got real-life storage inspiration from my room. Now, pop over and take a look at where Carolina does her lightning-fast crafts and amazing quilting projects for Always Expect Moore! 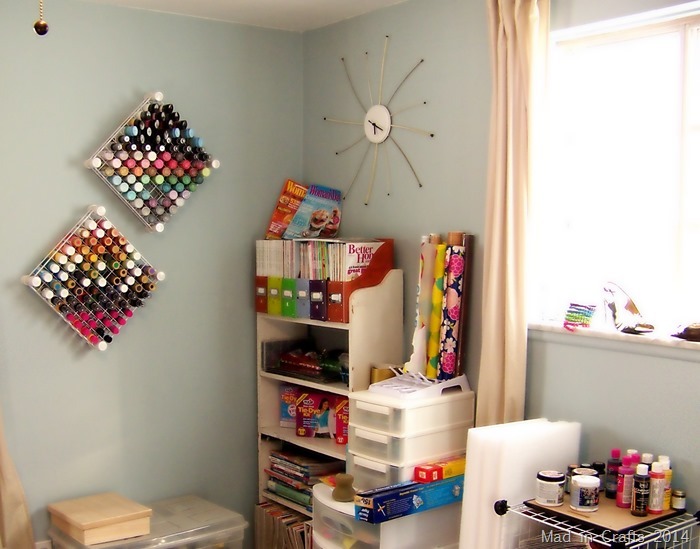 I always love your craft room Jessica! Love your space! Your paint rack is awesome…great idea!!! Wow, that some serious organizing :)! I am going to be organizing my craft room too and you just gave me some nice ideas to make the process much easier!!! Thanks. I love your blog, my blog is simplebirdiecrafts.com and I craft and DIY too, so your blog is a new craft inspiration for me!! I would love to subscribe but your subscribe button isn't working for me. Beautiful room, Jessica! I love the way you glammed up boring old shelf brackets! 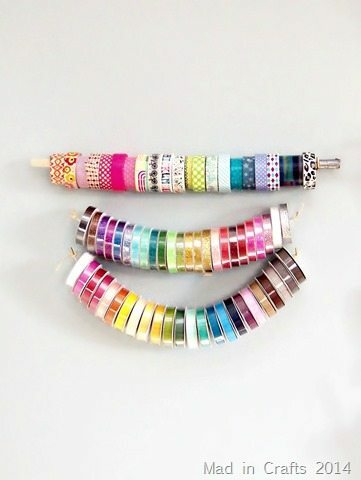 Good to see another "rainbow order on the walls" crafter! And that twirly cup thingy on the wall is a genius find. Thanks for sharing! I love the whole thing, especially the peg board! What is the name of the storage device that twirls and holds small items? We don't have Menards and I've never seen this but would definitely use it. Also, thanks for the idea for paint! I plan to use that. I've been looking for some way to store them with no luck. Dena, if you click through the link in the second to last paragraph, you will find Amazon links for the storage items I use in my craft room. Hope that helps! i love what you did. I am boarded and sew most because its good physio. I cant do what you and others do, doesn’t mean it does not inspire me. I have no sewing room and am looking at ways to do a bit. I cant order stuff from i.e favecrafts because they dont shop out ans we have to use amazon in SA which is difficult and not trustworthy. The shipping is expensive. I love seeing what can be done. Maybe one day before i get called Home i will have something going for me. All your bloggers are an inspiration. Thank you for sharing your knowledge with others.